On January 17, 2018, the French Prime Minister announced the cancellation of the gigantic construction project to build a useless airport on land in the municipality of Nôtre Dame des Landes. 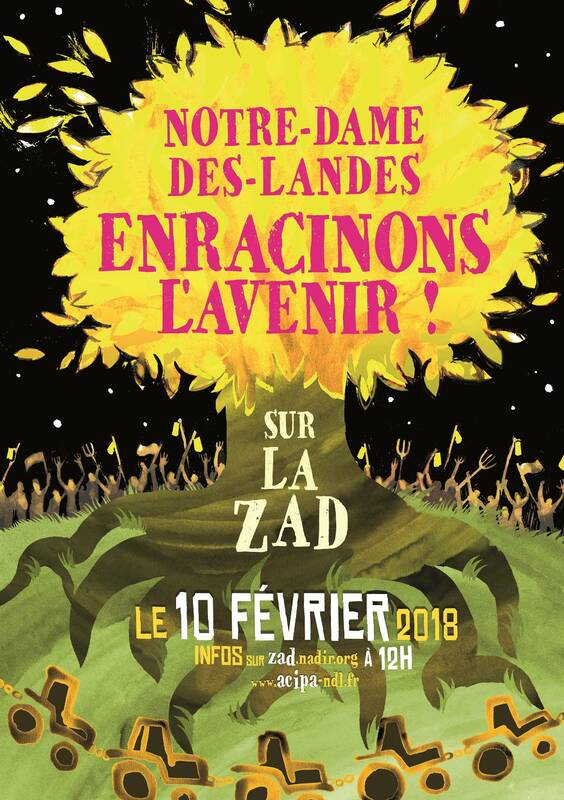 The joy and happiness unleashed among the resisters of ZAD,1 farmers, occupiers, neighbors, friends and sympathizers, reached its clamorous peak at the festival of February 10, the date marking the expiration of the Declaration of Public Utility for the stillborn Nantes airport. It was a moment to celebrate an indisputable victory and to enjoy something that does not happen very often. Of course, everyone knows that the struggle is not over, for the State will not allow its plans to be stymied that easily and will attempt to reconquer the lost ground sometime in the future, and will threaten legal action, plan evacuations, and initiate divisive maneuvers and measures to normalize the situation. Nonetheless, the 1,650 hectares of “bocage”, a kind of rural landscape of hedgerows and sunken lanes characteristic of the Atlantic seaboard, will be preserved, and with them, the commons, the new ways of life and social relations alien to the logic of the commodity that have been established among its inhabitants. The ZADist defenders have resolved to build barricades every time that the powers that be try to recover the territory, and to build a more free future around an Alternative Agricultural Zone. The airport project is as old as the protest that has always accompanied it, but the protest took a qualitative leap forward by abandoning legalistic procedures and engaging in creative occupation instead. In the summer of 2009, the name, ZAD—Zone to Defend—was popularized, and since then the repression directed against the occupiers and the local inhabitants was enforced in earnest, until its culmination on October 16, 2012 with “Operation Caesar”, a deployment of police forces that failed miserably and only served to increase the local people’s solidarity with the resistance. Against all odds, the inhabitants of the area have been able to reconcile their interests, overcome their disagreements and present a united front against all the anti-ZAD initiatives of the multinational corporation, VINCI, its local cheerleaders, judges and authorities. A community of struggle was consolidated, supported by numerous committees all over France. In one way or another, over the years, solidarity proved decisive at crucial moments, mobilizing huge demonstrations, and it is this persistence that forced the State to yield. ZAD was victorious. The largest and longest-lasting occupation in Europe succeeded. The struggle against the project has now reached a new stage: what is needed now is to preserve and extend the legacy of the struggle, develop alternative infrastructures, and engage in self-management of a liberated territory. The main thing is: to maintain and to reinforce the institutions of self-government, to avoid institutional traps and to resist the pressures of the market economy. In short, to forge links, to establish moral bonds of commitment, cooperation and mutual aid: what the sociologists call the social fabric. The struggle has ceased to be a principally defensive one, and has now become a constructive action based on non-developmentalist relations. Much has been accomplished (support networks, workshops, collective gardens, kitchens, radio, seed banks…), but there is still much to do. It is also necessary to prevent ZAD from degenerating into a marginal gesture, or from succumbing to its internal contradictions. A “customary assembly” was created in December of 2017 to mediate internal conflicts that arose as a result of divergent practices. The same assembly drafted a list of delegates to represent the different components of the resistance in order to meet with the emissaries of the State. These delegates cannot make decisions, but are limited to expressing the mandates of the assembly (a document that consists of six points). The assembly makes the decisions. It demanded, for example, amnesty for those who were threatened by expropriation or expulsion for defending the bocage, the unhindered right of the occupiers to remain to participate in the struggle, and a moratorium on the purchase and sale of land for at least three years, in order to prevent privatization that would militate against the collective experience. All to bring about a future without an airport based on the mutual respect of coexistence amidst a diversity of opinions. The ZADists do not devote much energy to negotiations; they know that they are swimming against the current and that the most they can hope for is to keep the enemy at bay, and gain time to posit new, more firmly-rooted forms of coexistence on the terrain. They are aware of the fact that the mobilizations have not ended, and that there are still problems that divide the occupiers, such as, for example, the question of the creation of a legal entity to represent the movement; and finally, they know that the movement’s internal equilibrium is fragile and the enemy’s resolve is strong. Without mentioning any other incidents, yesterday the gendarmes evicted the occupiers of the Lejuc forest, who were trying to stop a project to bury nuclear wastes in Bure (Meuse). No one can ignore the fact, however, that the movement has proven that it can stand up to adverse conditions; that it can concentrate sufficient forces to resist and turn the tide of events; and finally, that fighting is not a waste of time, and that, sometimes, you can even win. For a free and self-managed society! Translated in April 2018 from the Spanish text obtained from the author. 1. Zone to Defend [translator’s note].